This book is indexed and includes a DVD with color images and tables. The number of light ion beam (including proton beam) treatment programs is rapidly increasing worldwide: however, there are currently no practical guides to support the acceptance testing, commissioning, planning, and continuing quality assurance of these programs. 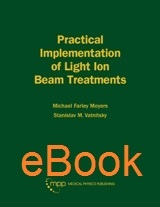 This book is aimed at those individuals who participate in the delivery and planning aspects of light ion beam treatments. Typically these individuals are medical physicists with responsibilities for calibration and verification of beam delivery, quality assurance, and computerized treatment planning: however other individuals may also find the book useful. This book provides practical recommendations and guides the reader through the steps of the treatment process, focusing on practical details.